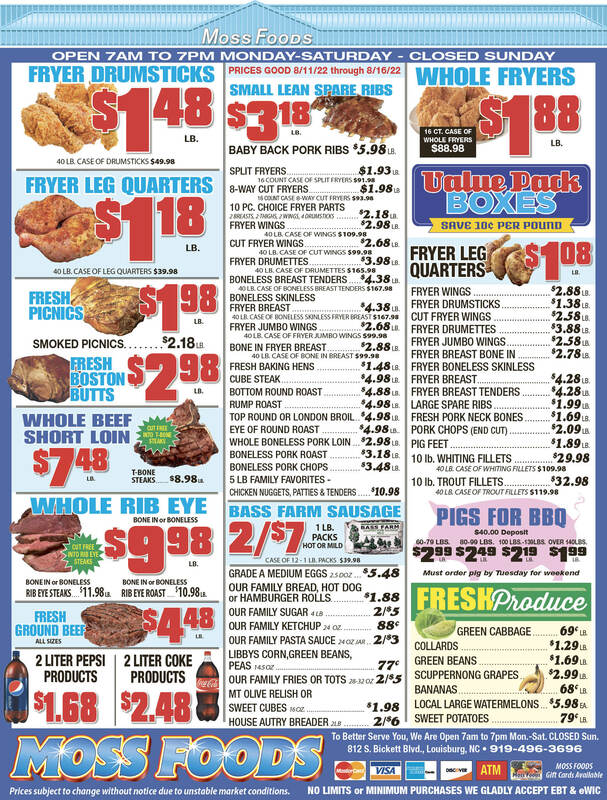 Showing 35 articles from March 22, 2013. LOUISBURG — Emergency communications staff advised commissioners that bugs continue to plague a nearly $11 million radio system. As time goes by, though, engineers are stomping out more of those bugs, staff said. AWARD WINNER. E. Carroll Joyner accepts United Way’s special recognition for his philanthropic work. LOUISBURG — To those who know him, Jerry Ritch is a man of action, not a man of words. He proved that yet again on Thursday, when the United Way of Franklin County presented him with its Wayne Stallings Volunteer of the Year Award. Ritch accepted the honor during United Way’s annual Community Breakfast and awards ceremony. But he was too choked up to speak at the podium. A Franklin County man who was convicted of trying to kill his estranged girlfriend is now suing the woman, claiming more than $20,000 worth of his personal items are missing and she’s responsible. In July, Superior Court Judge James E. Hardin Jr. sentenced Otto Gary Normand to between 125 months and 159 months in jail after the 59-year-old pled guilty to attempted first degree murder. LOUISBURG — A Franklin County man was sentenced to as much as 17 years in prison after officers found a truckload of suspected stolen items in his home. Sheriff’s deputies arrested Scottie Hunter last March after an investigation led them to his Perry Lane home and hundreds of items he was suspected of stealing from houses in Franklin, Wake and Johnston counties. Franklinton business marks 75 years of service! FRANKLINTON — A Franklinton business marked a milestone this week. While Cutchins Funeral Home Inc. deals in death, for the past 75 years, it has led a vital existence. “It’s just an awesome experience (recognizing this),” said funeral home president, general manager and CEO, Joe Cutchins Jr.
GOOD MORNING: First, Louisburg banned chickens. Then it banned honeybees and quilt blocks. Now, the town has protected us from a community garden, of all things! Just think how it would be without all these brave protectors of the community. Imagine waking in the morning to find chickens clucking, or honey bees buzzing. The author takes an example of a food we all love and suggests substitutes that are (allegedly) better for you and (supposedly) taste just as good. 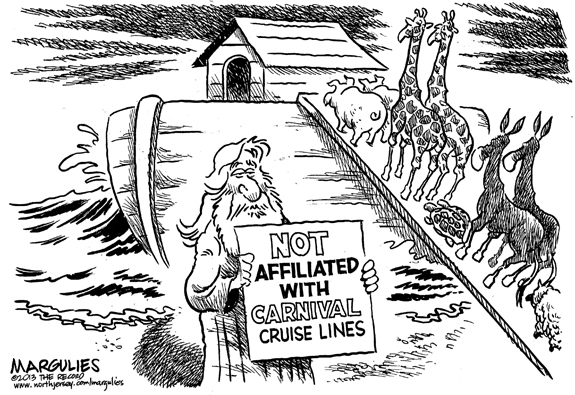 Yeah, I know, I’m not buying that premise either, but stick around for a moment and allow me to try to make a point. Franklin County now has a park site that fits the dream of the late Edgar Owens, the man who left much of his life’s legacy to the county along with the vision of a park with a fishing hole. On Monday night, his vision came a step closer to reality when county commissioners agreed on a 6-to-1 vote to purchase a site on Dyking Road just north of Louisburg. In addition to collecting sales taxes on items sold, North Carolina collects taxes on about 30 services. Now, Republican state legislators are looking to add about 130 more (“Lawmakers look at adding taxes to 130 more services,” News & Observer, March 19). FRANKLINTON— Weldon Baysmore Gaskill, 86, formerly of Norfolk, died Tuesday morning, March 19, 2013. A graveside service was held Friday, March 22, at the Gaskill family cemetery in Frisco. LOUISBURG – Irene Marion Kenlein, 90, died Wednesday morning, March 20, 2013. A memorial service will be held at a later date. ZEBULON - Kenneth Newell Pearce, 71, died Wednesday, March 20, 2013. Funeral service will be held at 2 p.m. today (Saturday, March 23) at Union Chapel Baptist Church, with burial to follow in the church cemetery. PILOT - Bennie Ray Medlin, 76, died Monday, March 18, 2013. A graveside service was held Thursday, March 21, at Gethsemane Memorial Gardens. 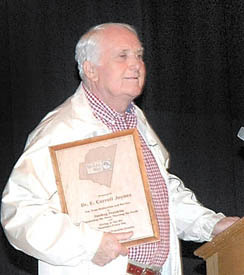 RALEIGH - Ora Jeffreys “Jeff” Chamblee, 88, died Tuesday, March 19, 2013 at the Oaks of Mayview. Funeral service was held Friday, March 22, at Emmanuel Baptist Church, Raleigh, with the Rev. Steve Tillis officiating. Entombment followed in Gethsemane Memorial Gardens, Zebulon. STRATFORD, VA - Tammy Johnette Martin Mandley, 41, of Stafford, Virginia died Tuesday, March 19, 2013. AUGIE AT HOME. Louisburg College’s Augie Ayers crosses home plate for another Hurricanes’ run during Wednesday’s triumph over Brunswick. 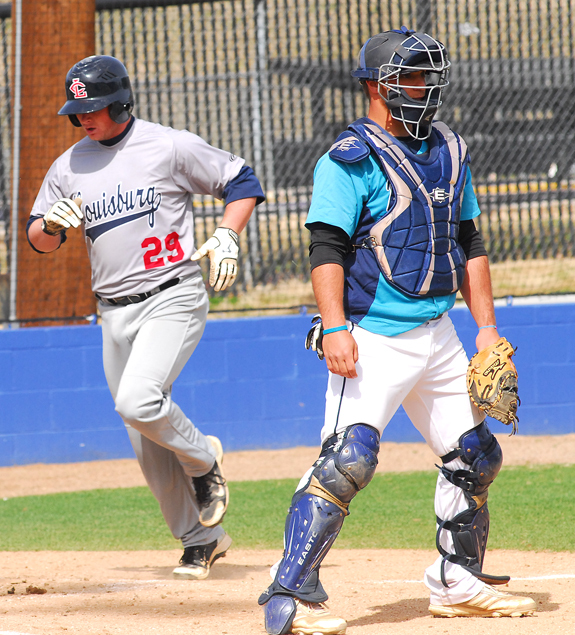 LOUISBURG -- Midweek games can often provide a few dilemmas for the head coach of the Louisburg College baseball program -- which is Keith Shumate in this instance. With the main focus on Region X weekend showdowns, the midweek matchups have been approached with a different tact by each of LC’s six skippers over the past two decades. THAT ELUSIVE BALL. 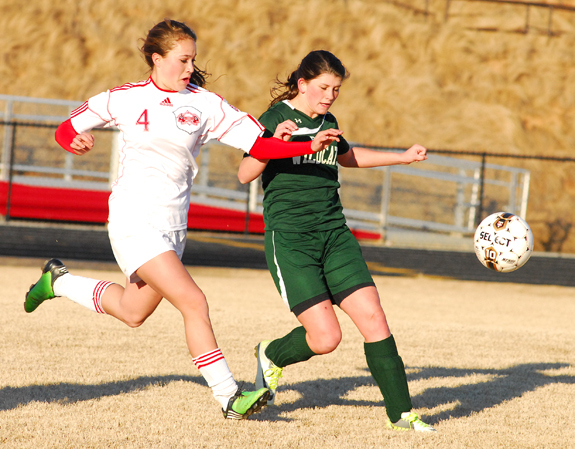 (L to R) Franklinton’s Hannah Rayman and Bunn’s Jaden Richards race for possession during Thursday afternoon’s Northern Carolina Conference girls soccer showdown at the FHS Football Field. FRANKLINTON -- Winds cold enough to cut through you welcomed players to an important Northern Carolina Conference girls soccer match -- with the loser destined to see its chances to finish in the upper echelon of the league all but blown away. To make matters worse, Franklinton and Bunn needed 20 extra minutes to decide the victory during Thursday’s showdown, which was staged in freezing temperatures and almost unbearable wind conditions. 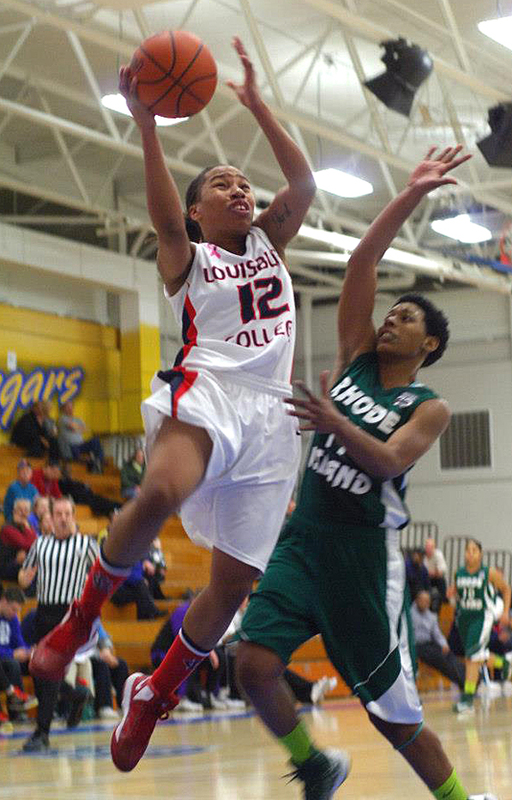 EAST PEORIA, ILL. -- Louisburg College found itself just two victories away from a national crown heading into Friday’s action at the National Junior College Athletic Association Division II Women’s Basketball National Tournament. Following a pair of impressive victories earlier in the week, the Lady Hurricanes moved into a semifinal contest Friday against host Illinois Central College in what will essentially be a road game for LC. GOING TO BE A PLAY. Pitt’s Casey Hargett (14) rounds second base as LC’s Haley Rollins (right) prepares to make a throw during Wednesday’s games. LOUISBURG -- Without a consistent shutdown pitcher on the roster, the Louisburg College Lady Hurricanes will have to execute flawlessly in other aspects of the game to compete with the top Region X fast-pitch softball squads. 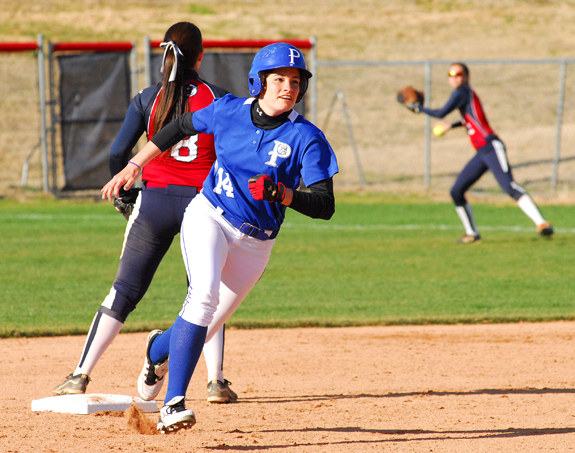 That assessment proved to be accurate Wednesday when the Lady Hurricanes hosted long-time rival Pitt Community College for a league twinbill at Sheilah R. Cotten Field on the LC campus. LOUISBURG -- Louisburg College will host a Louisburg Soccer Academy Spring Break Camp from April 1-4 on the LC campus. Times will be from 9 a.m.-noon each day. Boys and girls ages 6-14 are welcome. Cost is $75 per camper, which includes a T-shirt. LC head coaches Cristian Neagu and Andy Stokes will serve as the camp directors. IN THERE. Franklinton’s Mikaela Pulley (right) steals second base for the Lady Rams during Tuesday afternoon’s road softball matchup against the Louisburg Lady Warriors. LOUISBURG -- The roulette wheel finally landed on Franklinton’s name following a wild Northern Carolina Conference fast-pitch softball contest Tuesday night at backyard rival Louisburg. Neither team had a problem scoring runs as the clubs combined for a whopping 28 runs before Franklinton was able to secure a 15-13 conquest against the Lady Warriors. Roanoke Rapids at Franklinton 6:30 p.m.
Bunn at Northwest Halifax 4:30 p.m.
BUNN -- In a key pecking-order game in the Northern Carolina Conference standings, the Bunn Wildcats were defeated 7-0 at home on Tuesday against Corinth Holders. The Pirates took charge for good with one run in the top of the first inning -- and three more in the second frame. DISPLAY OF FORCE. 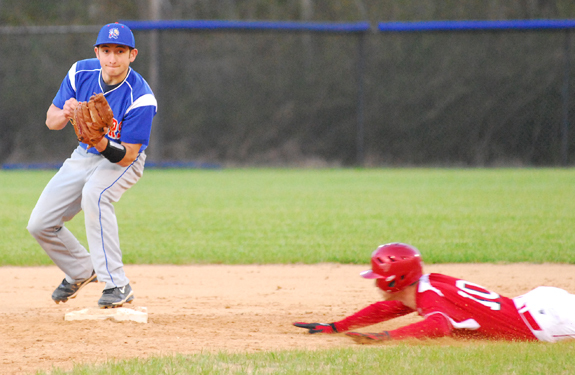 Louisburg’s Caleb Allen (left) forces Franklinton’s Matthew Davis at second base during Tuesday night’s Northern Carolina Conference baseball event. LOUISBURG -- Both coaches went to the bullpen looking for answers during Tuesday’s Northern Carolina Conference baseball showdown between Franklinton and host Louisburg. Only FHS’ Lester Wilder found an answer in the form of Dequan Neal. After both pitchers struggled through a high-scoring first inning, Neal helped Franklinton settle down en route to a 17-6 decision over Louisburg at Warrior Field. 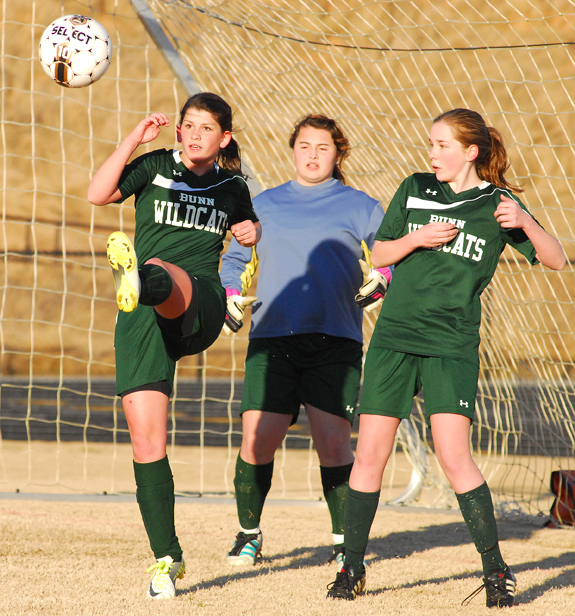 Bunn’s Jaden Richards (left) sends a ball out of harm’s way during Thursday’s Northern Carolina Conference girls soccer match against Franklinton. 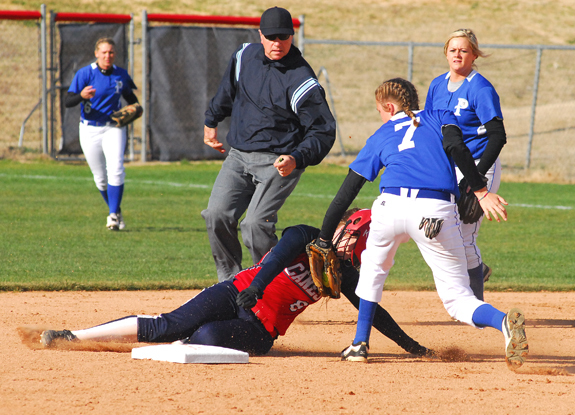 Louisburg College’s Morgan Tharrington (sliding) was unable to steal second base during this play as part of Wednesday’s home softball doubleader against Region X foe Pitt CC Lady Bulldogs. After meeting in a specially called session Thursday morning, the Franklin County Board of Education voted to terminate the teaching contract of Valorie Mingo, an exceptional children’s teacher at Franklinton High School. 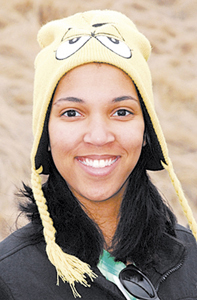 The termination was effective Thursday, March 21, school officials said. LOUISBURG — Two Youngsville businessmen are continuing their battle against Franklin County’s decision to shoot down their gun range. One of those battles, which was scheduled to take place in front of the Board of Adjustment this Monday, will take a bit more time. That meeting was cancelled for an expected inability to generate a quorum. 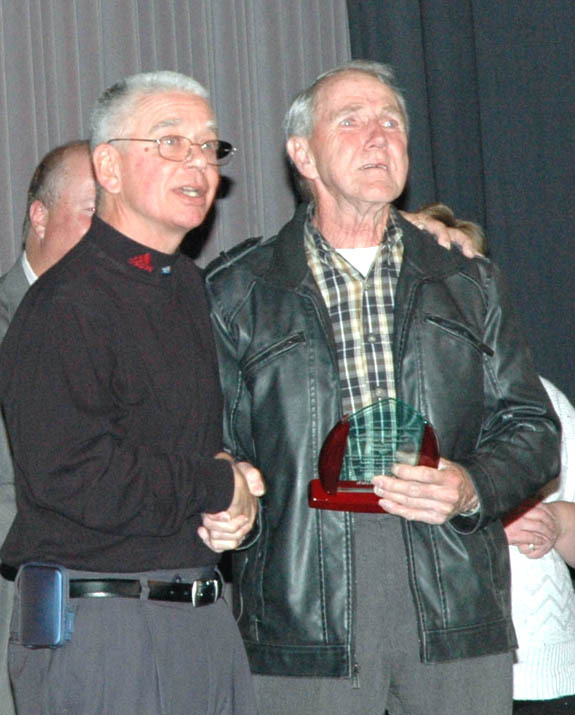 Wayne Stallings, left, presents Jerry Ritch with the Volunteer of the Year Award. Franklin County sheriff’s deputies are looking for suspects in two possible break-in cases. At about 12:30 a.m. on March 20, a landlord reported that someone tried to break into a property in the 400 block of Mount Hebron Road in the Castalia area of the county. According to the report by Dep. Brandon Strickland, they arrived to meet the landlord, who told officers that the resident was at home when she heard someone trying to open the back door. Unemployment rates increased in all of North Carolina’s 100 counties in January. Franklin County’s rate went from 8.9 percent in December to 9.6 percent in January — the most recent data available. It was still below the state’s unemployment rate for January, which was listed at 10.2 percent.